ithrive31 workshops are held as 1-3 hour group sessions and are perfect for leadership meetings, women’s groups, lunch presentations or conference breakout sessions. 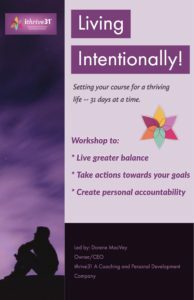 Our foundational workshop, “Living Intentionally”, is tailored for individuals looking for ways to create greater balance, take actions toward their goals and create greater accountability in their life. We’ll share practical ways for living intentionally and setting a course for a thriving life, 31 days at a time.